Whether you are a homeowner looking to stay safe during DIY or a builder looking to increase your productivity, finding quality scaffolding at the right price is key. Here are five no-nonsense tips for hiring scaffolding for less in Melbourne. To minimize your costs, you should only hire from a scaffolding firm with current public liability and proper insurance. Public liability insurance covers the firm for up to $20 million should an accident occur. Should you hire a firm without this insurance, you may be left out of pocket. In the case of a homeowner, the home insurance policy could be claimed against in the event of an accident. For a building firm, additional insurance cover would need to be purchased. 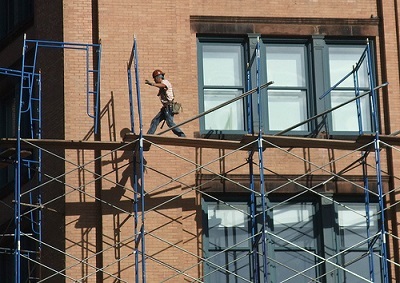 Only hire scaffolding from a firm whose staff members have the right insurance coverage. Most scaffolding jobs can be quoted off the plan. However, you may be left out of pocket if you order too much or too little scaffolding for your job. By choosing a firm that offers free scaffolding rental quotes, you can guard against losing money. For example, if you order too little scaffolding, work may be delayed while more is ordered. If you order too much, you are effectively throwing money away. Some projects cannot be quoted from your plans or, in the case of homeowners, there may be no plans at all. For complicated or small jobs, choose a firm offering free on-site visits. A trained member of staff will visit your premises and discuss your needs. As before, this will help you avoid the pitfalls or ordering the wrong quantity of scaffolding. Many individuals and firms lose money due to long minimum hire periods. Shorter minimum hire periods of around two weeks will help save you money. For example, if you order scaffolding from a firm with a one-month minimum hire period, you will be left out of pocket in you have to order more scaffolding a few weeks into your project. If the dates don’t match, you will be paying more than you had to in order to rent the scaffolding. Choose a firm offering scaffolding hire periods of around two weeks to help maintain your cash flow. Reputable scaffolding firms will recognize that you can’t always work from nine to five. Always choose a firm that can install scaffolding outside of normal business hours at no extra charge. Both, homeowners and commercial builders, often require installations to be conducted outside normal business hours in order to fit in around their schedules. To keep your costs down and save money, choose a firm that is happy to install and dismantle scaffolding on weekends, night shifts, and public holidays at no extra charge. These five tips should help anyone find scaffolding at the right price in Melbourne, without feeling shortchanged.